Our solution is a deployable, reusable spinach greenhouse for Mars. Internally, a fully equipped aeroponic system operates for ~45 days, having all the needed resources, sensors and electronic systems to stabilize the internal environment and help the spinach growth. Also, there are systems for harvesting produced oxygen during the process and the plants at the end of it. Externally, photovoltaic panels provide power, while several cover layers protect the system against Mars extreme conditions. 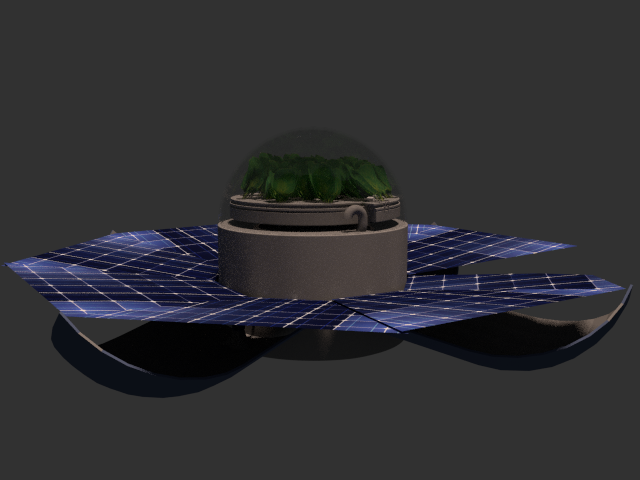 In the current project, we design a deployable greenhouse, which can survive in the extreme conditions of Mars surface. The design is based on the assumption that the greenhouse will be landed near the equator. A landing area like Arabia (~ 5 degrees latitude and longitude) seems to be the optimal one. In such an area, the sun rays hit vertically the photovoltaic panels (PVP), there are no extreme weather conditions like in Mars' south pole and the geology of the area is smooth enough for deploying the greenhouse. Without human intervention, the greenhouse operates for approximately 45 days (spinach life cycle). This period can vary up to 65 days depending on the planted plants. After this period, the stored oxygen (O2) and the produced seeds are ready to be collected. After elementary maintenance and seeds planting, the greenhouse is functional again and ready for the next harvest. The volume of the greenhouse, before deployment and during the (Mars) night is around one cubic meter. The thickness of the greenhouse cover is 100mm. There is also 50mm space between the cover and the main body for storing the PVPs. During the day, when the covers open and the PVPs are deployed, the greenhouse occupies a circle area of around 1.5 meters radius. cylindrical part of 600mm height, 500mm radius and 50mm thickness made of carbon fiber. This is where the majority of the mechanical parts and growing materials are stored. 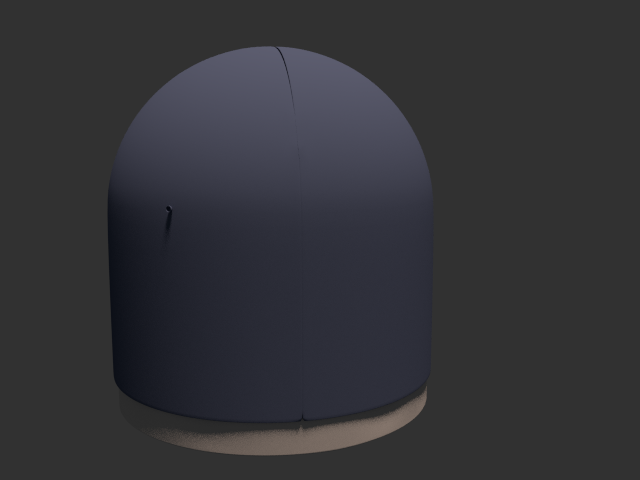 hemispherical part of 500mm radius and 6mm thickness placed on top of the cylindrical part. It is made of optium acrylic material, which is anti-reflective and UV resistant. More details on the github wiki.